The intentional destruction or appropriation of cultural heritage, especially during genocide, often becomes a haunting symbol of violence. Yet its restitution or rebuilding can also signal survival, recovery, even reconciliation. When communities reclaim and reconstruct their heritage after trauma, these processes are fraught with negotiation and contestation. Art objects are central to this, as they mediate group identities in complex ways. They prompt questions about the relationship of art to trauma and survival, as well as the human right to culture. This lecture follows the case of an illuminated medieval manuscript known as the Zeytun Gospels. Toros Roslin, the most celebrated Armenian artist of the Middle Ages, created it in 1256 in the Eastern Mediterranean at the time of the Crusades. The book functioned as a sacred relic in Zeytun, a rugged mountain town in present-day Turkey, until 1915, when Zeytun’s inhabitants were deported and largely exterminated during the Armenian Genocide. The manuscript was removed from the church, caught in the vagaries of war, and sundered. 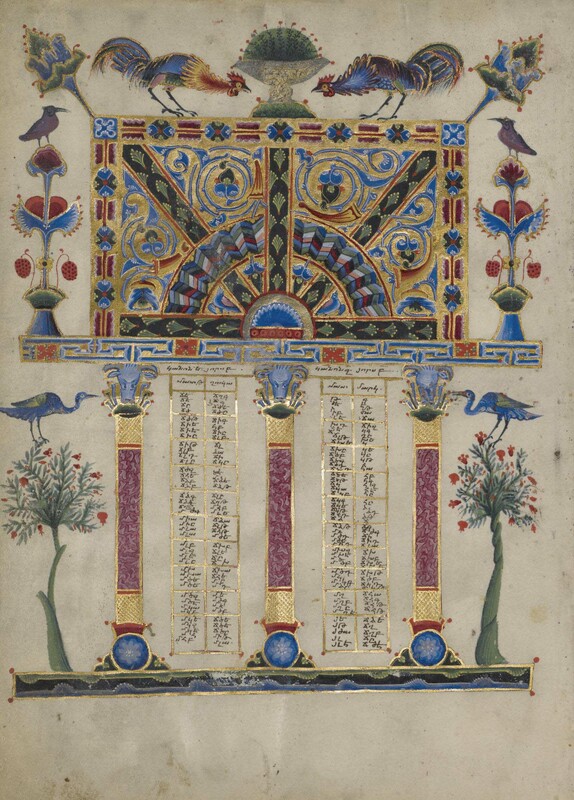 Its most beautiful pages -- eight folios illuminated in jewel-like colors and gold leaf known as the Canon Tables – ended up in the Getty Museum in Los Angeles. In 2010, the Armenian Church sued the Getty in California, seeking their return. After several rounds of arguments, the parties settled in late 2015. The Getty acknowledged that the pages belonged to the Church, and the Church, in turn, donated the pages to the Getty. The tale of this beautiful and densely meaningful object, and its extraordinary journey embody some of the defining elements of art history in the 21st century. I take the much-publicized legal battle as a point of entry to explore how contests over art objects are framed, what cultural heritage signifies to survivor communities, and how institutions like museums curate and display works of art with painful histories. The Gospels is the only object that survives from the rich cultural and religious life of Zeytun and its surrounding monasteries. One of the last vestiges of this forgotten Anatolian mountain town has connected with contemporary American law, cultural activism, the art market, and museum politics, evidencing the continued relevance and urgency of cultural heritage. Heghnar Zeitlian Watenpaugh is Associate Professor of Art History at the University of California, Davis. Her research concerns urban and architectural history in the Middle East, gender and space, as well as the critical theory of architectural preservation, histories of museums and exhibition practices, and the politics of heritage today. Her book, The Image of an Ottoman City, was awarded the Spiro Kostof Book Prize from the Society of Architectural Historians. She has also received the Best Article Award from the Syrian Studies Association, and the Omer Lutfi Barkan Article Prize from the Ottoman and Turkish Studies Association. Her research has been supported by fellowships from the J. Paul Getty Trust, National Endowment for the Humanities, Fulbright-Hays, Social Science Research Council, the Center for Advanced Study in the Visual Arts at the National Gallery of Art, and the Office of the President of the University of California. She has served on the boards of the Society of Architectural Historians, the Syrian Studies Association, and the Historians of Islamic Art Association, among other professional organizations. Image caption: Canon table page, T'oros Roslin, (active 1256-1268), Hromklay, Armenia, J. Paul Getty Museum, Gift of the Catholicosate of the Great house of Cilicia. Free and open to the public. Parking permits may be purchased at the information kiosk just inside the main campus entrance. Visitor Parking Information.